Keep your eyes pealed for “Earth Zebra Was Here” sightings! You just never know where he will turn up next! If you happen to see any, email them to me and I’ll post the picture here! During the Forties, Kilroy was everywhere. “The outrageousness of the graffit was not so much what it said, but where it turned up.” He cites the torch of the Statue of Liberty, the Arc de Triomphe in Paris, the Marco Polo Bridge in China, huts in Polynesia, and a girder on the George Washington Bridge in New York. 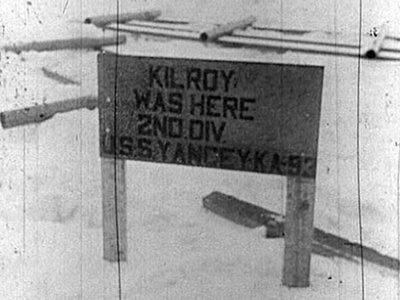 There were contests in the Air Force to beat Kilroy to isolated and uninhabited places around the globe.